There are a lot of platformers, racing games, and puzzles on iOS, but there isn’t much in the way of unique strategy titles. People have tried to do real-time strategy games before, but games like Red Conquest just haven’t done very well (even though I thoroughly enjoyed that title). 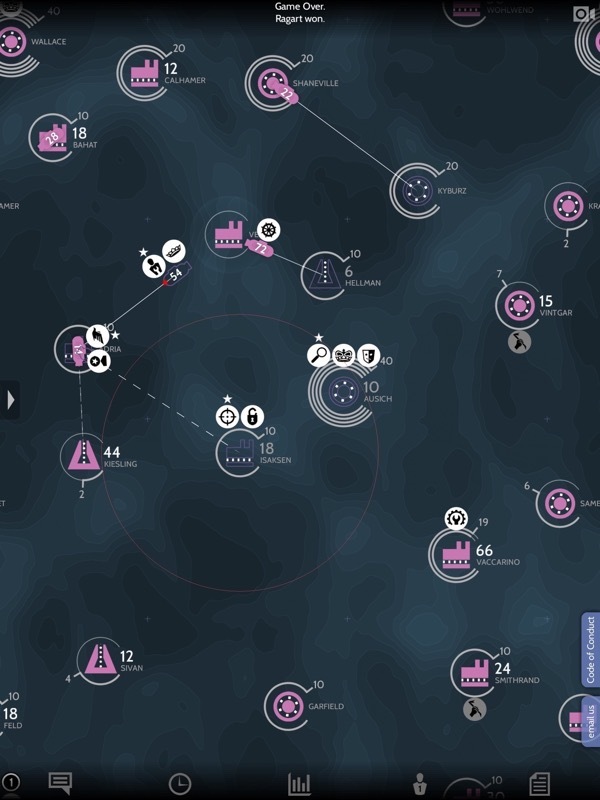 Subterfuge is a different take on real-time strategy because it’s basically turn-based in nature. Battles unfold over hours and days, instead of minutes. But don’t worry: thanks to some really clever in-game features, Subterfuge manages to balance in-depth strategy with truly mobile and accessible gaming. 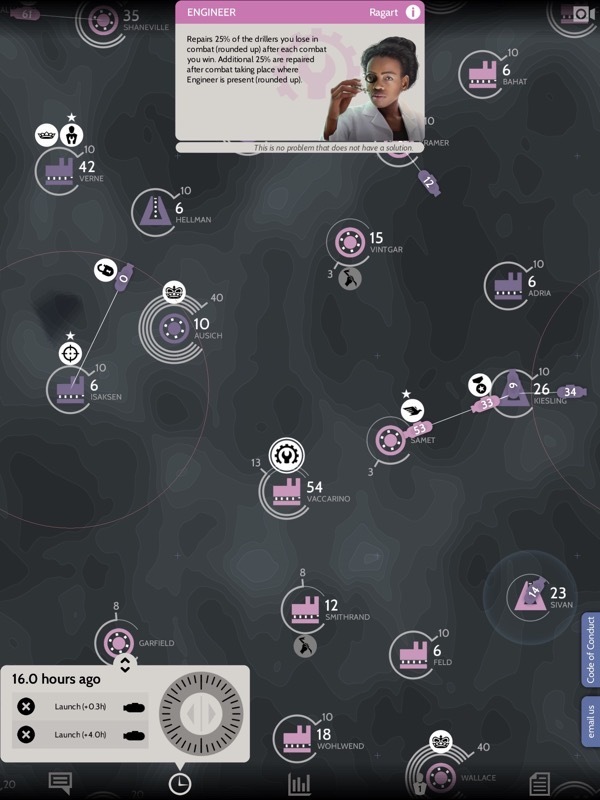 Every player in Subterfuge starts out with a home base and a few generators or factories. The ultimate goal is to mine 200 units of Neptonium, but you can also win by capturing all of your opponents’ queens, or crippling their economies until they surrender. The basic action unfolds by sending drillers (created by factories) to attack someone else, or defend your territory. Battles are just simple math: whoever has more drillers and shields at the end of combat wins. The catch is that submarines full of drillers can take hours, if not days, to reach a destination. So the 30 submarines you sent to attack an empty outpost might actually have some defenders to contend with once they arrive 17h00 later. Attacking isn’t just a matter of loading a sub up with all of your drillers, but also considering what other reinforcements the enemy might send before your sub arrives at its destination. Luckily, there’s a great time wheel mechanic to help simulate the foreseeable future. The time wheel lets you simulate up to 48h00 in advance, based on currently known conditions. Basically, everything that isn’t covered by the fog of war will be made known to you. The time wheel takes a little while to get used to, but it’s a great way to check who will win a battle in current conditions, or whether your generator’s shields will regenerate enough before an attacking force arrives. That’s all before we even discuss the idea of specialists, whose abilities can warp the rules of combat and production. A trip that normally takes 12h00 can suddenly take only 4h00, if you’ve got a Smuggler around. You’ll also need far fewer drillers for an attack if you’ve got a War Hero along for the ride. If that’s still not complex enough for you, then consider the fact that Subterfuge can support up to 10 players in a single match. Alliances can switch up on the fly, and players are free to message whomever they wish at any time. I tried to gather a group of friends to play, but I’ve only participated in one-on-one battles thus far. Starting a game of Subterfuge can definitely be daunting, but the game’s own tutorials do a pretty good job of educating you quickly. What I want to point out, after having spent a week playing Subterfuge, is that all of this time-warping and submarine sending really is quite a lot of fun. Subterfuge has a minimal style all its own, and I think it’s great for fans of games like Civilizations, who enjoy the feel of a long-drawn out campaign with lots of diplomacy and risk-taking. Subterfuge is free to play, although you’ll be able to plan an unlimited number of moves with the $12 in-app purchase. I stuck with the free version during my time with this game and still felt like I was given enough room to maneuver.